HTC has a way of connecting with their fanbase through Facebook that other handset makers do not have. 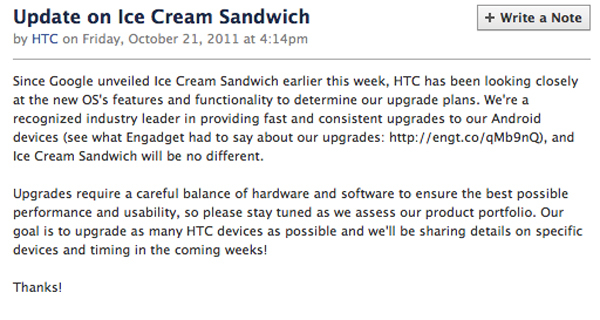 Recently, the company has detailed their upgrade plan on their phones to Ice Cream Sandwich, Google’s new operating system that was announced officially last week. The skinny is, they are going to “upgrade as many HTC devices as possible.” We all know that carrier specific user interface complicates Android upgrade processes, but as far as those go, HTC’s Sense interface is one of the better ones in the game. Nothing will officially happen on the ICS front until the Samsung Galaxy Nexus is released so we can expect to see these upgrades rolling out at the earliest, beginning of next year.